Braeburn apples are my favorite apples, but even with high tech, controlled atmosphere storage, their season is relatively brief so I eat a lot of them and make sauce out of a lot of them and dry a lot of them. (Have I mentioned that I like Braeburns?) But what I like to do best of all is bake them. Hot from the oven, a great dessert, especially with a bit of sweetened cream. But when you consider the ingredients, it’s clear that this is a dish best served at breakfast. Cut a small layer off the bottom of each apple to create a flat, stable bottom surface. With a paring knife, cut a cylindrical cone out of the top of the apple, moving about 1-inch outside of the core, similar to removing the top of a pumpkin when carving a Jack O'Lantern. Remove the top and discard. Using a melon baller or a teaspoon, remove the remaining core and seeds, taking care not to puncture the base of the apple. Place apples on a baking sheet or pie dish and fill, almost to the top, each center with honey. Spoon in mixture till full, then pack it down lightly. Add additional mixture until heaped and overflowing over sides of the apples. Bake on the top or middle rack of a 350 degree oven for 40 minutes or until the oat filling is golden brown. To check if apples are done, take tongs and squeeze the apples gently. If they give, they are done. Let stand for 10 minutes before serving. This mixture is called a streusel and it's one of the most powerful multitaskers in the dessert universe and can be baked onto or on top of just about anything. I always make extra and freeze it in an old yogurt container so that I always have it on hand...until I use it up. Yum! I used to have a lot of baked apples. My grandmother made them. Then I made them for her. Now I want them again. Thanks Alton! It allows individuals to produce a list of motion pictures by watched and also unwatched independently. We could experience. How much butter is in a stick of butter for this recipe? The butter I buy is definitely larger than a regular stick. If the oz. is by weight, why then is it necessary to “pack ” the brown sugar? OMG That is exactly what I thought! No idea. I’m confused by the instructions with the honey…. Are you supposed to fill the entire cavity of the apple with honey? Then pack in the topping? 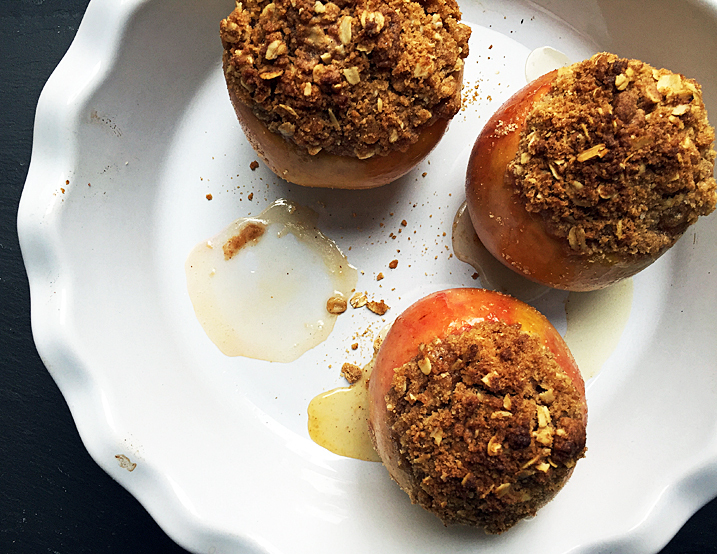 The recipe only calls for 4 t honey for 4 apples, so that doesn’t really make sense. Place apples on a baking sheet or pie dish and add one teaspoon honey to each each center. Spoon in mixture till full, then pack it down lightly. Add additional mixture until heaped and overflowing over sides of the apples. Are the oz. measurements by weight or as marked on a measuring cup? Ounce markings on a measuring cup are for liquids only. Here the oats, flour, and sugar are all listed by weight – use a scale to measure out the ounces. Had fun making these, and they tasted amazing! Wouldn’t have expected anything less though, Alton! Thanks for sharing! Hmmm….I have a counter full of NC apples right now; should I sacrifice sleep and make these for breakfast in the morning? ○can organic agave be subbed for honey? ○Could I add toasted pecans, chopped to the oat mixture? ○Can I place each apple in a Pyrex small dish or muffin tin? ○ Can I refrigerate for a day and reheat? ○ Can I use a custard base inside the apple. Put top on. Bake stuffing separate in enclosed dish for a different approach? Apples are delicious. I must try this recipe.